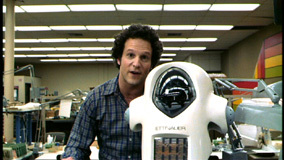 There’s a little bit of genuine prescience, inspiration, and intelligence coursing through the veins of Real Life, Albert Brooks’ directorial debut, but mostly the smattering of each that the movie provides just makes you crave more. In this 1979 feature, Brooks satirizes the then-new trend toward reality television, by setting up a plot that doesn’t nearly seem as far fetched nowadays as it must have seemed then. In the film, Brooks plays himself as a nebbish comic who mounts the production of a new sort of cinema that intends to draw its drama from the trials and tribulations of a real world family. 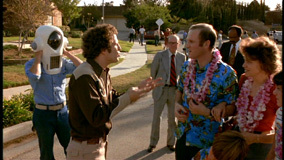 A few clunky expository scenes (including a pre-credits sequence that seems to have been added on after filming completed) set the stage before Brooks and his camera crew move in across the street from a “normal” Phoenix, Arizona family, and suddenly begin getting drawn a bit too close for comfort into their “real” world. Most of the scenes in Real Life are a bit too broadly played, and the overall level of humor in the film suffers as a result. For every sly satiric element that feels dead on, there’s a scene that seems too far removed from the “real” life that is being satirized. 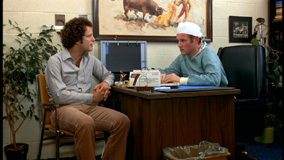 It’s tough to imagine that most audience members would be able to relate directly to the elaborate set piece when the veterinarian at the head of the family (Charles Grodin) has to perform an emergency procedure on an ailing horse. The numerous behind-the-scenes sequences that show the decision making process that guides the show’s direction and explain its set up feel like unnecessary filler too. After the film promises to focus on the family, the egocentric concentration on Brooks’ plight as a filmmaker comes as a disappointment. Even though Brooks is a filmmaker as self-obsessed as anyone this side of Woody Allen, he fails to create a persona that makes us genuinely interested in his neurotic concerns and illusions of grandeur this time out. Since Real Life is so obviously tailored to Brooks’ talents (he wrote, directed and stars in the film), you’d expect him to have a better conception of what his role is, exactly. Unfortunately, the film pales in comparison to much of his later work, since his function is somewhat indistinct. He has to play here the self-referential narrator, the exasperated clown, the Machiavellian villain of his era, and the everyman who’s stuck in an impossible situation, but collectively it’s too much weight for his sketchily drawn character to bear. Instead of consistently building momentum from its comic inventions, the film feels too episodic and often disconnected from itself. It begins attacking too many subjects (Hollywood, the media, psychoanalysis, suburban mores, etc…) to skewer any of them effectively. Worst of all, it’s tough to gather any sympathy for any of the characters involved once things begin spiraling out of control, since we’re reminded that they all volunteered for this folly. Admittedly, it’s probably impossible to judge a satire about reality programming that was made twenty-five years ago. Real Life’s far-fetched prognostications have become our reality though, so it’s precisely because it doesn’t go far enough in its inventions or its specificity that it fails to develop into anything that still feels really mordant.